My Greek friends will probably make fun of me on the following recipe but I figured that what may seem like a naively-simpleminded & artlessly traditional legumes-soup to a Greek, could in fact be an unknown source of high nutritional value, a warm, wintry, super-healthy, and super-easy comfort food —hence, The Legumes Chronicles series, where I will be giving you basic recipes for the most common pulses used in Greek cuisine, along with some interesting twists around them! Place your pulses in a large bowl, full of clear water, and let them soak overnight. The next day drain and then boil legumes in lots of clean, plain water with a teaspoon of mustard powder for 10 minutes. Drain & rinse them out a bit under running water. Proceed to your recipe. Time: 30mins + 10mins prep. It is always best if you can find organic chickpeas. If you don’t like them with their skin on, after you’ve soaked them overnight “rub” them together while in your drainer and the skin will come off. Personally I don’t mind it at all, I find no difference in texture or in taste and have not even bothered with it when making hummus, as I have found out that the chickpeas blend to perfection regardless. 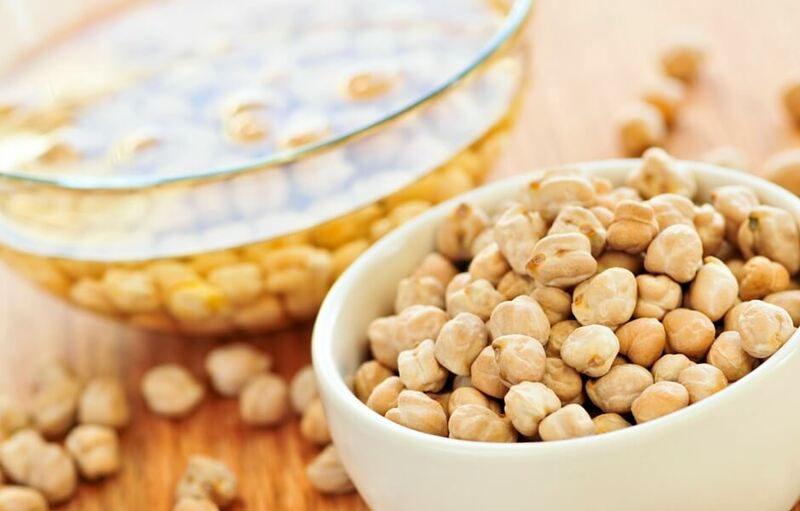 You can always buy pealed dry chickpeas but such processing is not customary for organic products and searching for some may be a challenge. Place chickpeas in your pressure cooker, add 1000 ml of water, the onion (chopped up), the olive oil & lemon juice, salt & pepper to your liking. Seal the lid and cook them for 20-25 minutes on medium heat. Let the steam off, unseal and open the cooker. Add a cup of finely chopped fresh coriander and boil for 5 more minutes. I also like it when I can “feel” the chopped up onion pieces in my soup but you can use a whole onion, take it out when you unseal your pressure cooker, run it through a food processor and pour it back in for the final boil. For a more porridge-like consistency puree 4-5 tablespoons of your chickpeas with the onion and pour it all back in the pot during the final step. You can definitely skip the coriander thing (or use parsley in its place) but to me, it is this particular “twist” that makes an unexpectedly interesting and tasteful addition! 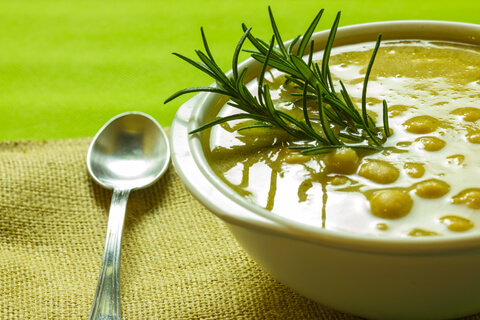 When your soup is finally served squeeze a few drops of lemon on top, add a drizzle of raw olive oil & a pinch of freshly ground pepper. Προετοιμασία: Βάζετε τα ρεβύθια να μουσκέψουν σε μπωλ με καθαρό νερό από το προηγούμενο βράδυ. Το επόμενο πρωί στραγγίζετε, ξεπλένετε και τα βάζετε στη χύτρα ταχύτητας με ένα κουταλάκι του γλυκού μουστάρδα σε σκόνη. Δεν σφραγίζετε τη χύτρα και τα βράζετε απλά σε δυνατή φωτιά για 10 λεπτά. Στραγγίζετε ξανά & σκουπίζετε τη χύτρα. Βάζετε στη χύτρα ταχύτητας τα ρεβύθια, το νερό, τα κρεμμύδια τεμαχισμένα, τον χυμό του λεμονιού και το ελαιόλαδο. Αλατοπιπερώνετε κατά προτίμηση. Σφραγίζετε τη χύτρα και βράζετε με την ειδική βαλβίδα για 20-25 λεπτά. Αφού χαμηλώσετε τη φωτιά, αφαιρέσετε τη βαλβίδα και μπορέσετε να ανοίξετε τη χύτρα, ρίχνετε τον κορίανδρο και βράζετε για 5 λεπτά ακόμα. Κατά την ταπεινή μου άποψη ο κορίανδρος κάνει όλη τη διαφορά, αν επιμένετε όμως -κλαψ, κλαψ!- μπορείτε να τον αντικαταστήσετε με φρέσκο μαϊντανό. ❮ ❮ My dear deer! – Τα ελάφια της Πάρνηθας! I love chickpea soup! For dinner, lunch or breakfast I make it all the time! Never tried it though with saffron. I will ! For color and extra health goodness! Yes Katina, I know I mentioned it on Facebook and I should update the post soon, to add this here too. I truly believe it works but if you try it, do let me know what you think! Saffron works with just about everything! Should be great with chick peas as well! Στο επόμενο τραπέζι λοιπόν θα έχουμε… ρεβύθια!! Χεχεχεχε! Ε όχι, σε καταλαβαίνω! Ούτε το δικό μου στομάχι τα “σηκώνει” τόσες μέρες συνεχόμενες!! 😛 Έ-λε-ος! Thank you so much for taking the time 🙂 I really appreciate it!